WHEN ALL ELSE HAS FAILED – SILVER WHINNYS® SUCCEED - SO WHAT ARE SILVER WHINNYS ? Equines can suffer from a variety of lesions that affect their Lower legs: dermatitis, scratches, mud fever, dew poisoning, greasy heel, summer sores, and wounds. Silver Whinnys® provide the critical qualities in bandaging/leg protection that allow non-responding cutaneous (affecting the skin) lesions to finally heal. They end the cycle of infection/re-infection. Silver inhibits the growth of bacteria and fungi in the socks. They are safe, non-toxic, drug-free bandages that obstruct disease-causing pathogens, insects, dirt, debris, and sunlight (UV) from penetrating the socks and reaching the skin. You found us, and that is a vital step in your efforts to help your horse heal! Anyone who has owned a horse suffering from severe, non-responding, and various manifestations of Equine Pastern Dermatitis (EPD) knows these are not skin conditions cured with a simple application of over-the-counter ointments. If they could be cured as simply as this, your veterinarian and treatment bills would be much less expensive. Severe cases change not only the quality of an equine's life but its owner’s as well. The financial cost of healing is compounded by added stress and countless hours of care. The ABCs below are the reasons Silver Whinnys® will be the best bandaging and leg protection you have ever purchased for your horse’s legs. Aside of saving hundreds of dollars in throw-way bandaging, reusable Silver Whinnys have all of the vital qualities necessary to protect your horse while healing. They offer qualities that traditional bandaging cannot provide. More veterinarians are including our socks in their treatment plans when protecting the tissue is essential to health and healing. A. With Silver Whinnys, valuable oxygen can reach the skin. The socks breathe. Oxygen has long been recognized as important to healing as it helps dry excessive moisture and allows more durable granulating tissue to develop. The socks also block dirt, insects, and debris that present obstacles to healing when sores and wounds are left open to the air. The double layer of woven sock provides a barrier against disease-carrying insects while protecting UV sensitive skin. B.The silver in the socks makes an antimicrobial barrier that prevents dangerous microbes from reaching the tissue. Bacteria and fungi must pass through the double layer of protection in order to re-infect the skin. If the socks are changed daily with clean socks, the power of the silver to inhibit bacteria and fungi from passing through the socks to the tissue remains optimum. After the first 24 hours the sheer number of germs in a barn environment can finally overwhelm the silver in the socks, so changing them daily is important to keep the healing on track. See our FAQ page for Silver Whinnys for more questions answered about how they manage the environment relative to your horse’s condition. C.Silver Whinnys wick moisture from the skin surface. They absorb and remove the dampness caused by exuding body serums. This moisture is absorbed and transferred to the exterior of the sock where it can evaporate from the surface. Traditional bandaging traps damp, warm material against the wounds and dermatitis the same way that a dirty diaper holds undesirable moisture and materials against a baby’s tender skin. The wicking action of the socks helps keep the surface of the skin dry. It defeats the warm moist environment that bacteria and fungi must have to propagate. Not only do the socks keep the tissue dry but also in the summer months, these moisture-managing properties of the socks keep legs cool. It is the same cooling action provided by a light cotton shirt that takes the sweat from your body and allows it to evaporate, thus cooling your skin temperature. Our socks utilize the same moisture management yarns used in the highest quality athletic socks that keep feet dry and cool during the demands of sport competition. In the course of healing, inflammation, infection, and re-injury can cause slow healing. The development of proud flesh, exuberant tissue, is a by-product of slow healing. Proud flesh is NOT a product of too rapid a healing! It is the body overreacting to impaired healing. A healthy speed of healing is desired and that means dermatitis, wounds, and sores all need to be protected from the hazards that prevent a healthy, rapid healing. For the large breed horses, continued unresolved dermatitis can lead to devastating conditions. The edema of Cellulitis causes the destruction of blood vessels. Lymphangitis causes permanent tissue damage and the destruction of lymph vessels. Vets understand the risks of slow healing, which is why they seek to aggressively handle the inflammation and infection putting your horse at risk during these episodes. Once these conditions are stabilized, Silver Whinnys® are a proven tool to help you and your vet protect legs from the hazards of the equine environment that drive equine legs to these dangerous episodes. For more about Lymphangitis and Cellulitis see our article of September 6, 2016 published in EquiManagement Magazine. The silver used in the construction of our socks will never wash out. It will not weaken. It will not degrade over time. The silver will be as strong the day you throw these socks away in shreds as the day you bought them. We do not use “infused” silver, which is a method of dunking garments in an environmentally egregious chemical bath. Our silver is there to stay in our socks and meets the highest level of environmentally safe manufacturing standards. The best way to clean them is to machine wash and dry them. This removes the greatest amount of exuded material and bio-burden from the socks. Use a “free and clear” detergent. Avoid bleach as it destroys elastic. You can use OxyClean® to help whiten if you wish. Do not use dryer sheets as the chemicals used in fabric softeners or perfumed detergents are not what you want against angry inflamed skin. "The reason for my purchase is due to my 3 year old getting ulcerated lymphangitis and having to have a skin graft to replace the damage caused ! "This is where we had taken the skin grafts from! Yes only one leg my vet has been amazing she has been on a lot of meds but flamazin cream on every day she did have a big compression bandage on for 5 months"
"She has only just come over from Holland and not been handled she has a tiny cut on the back of her foot and her immune system way shot and couldn't fight anything off! It got really bad"
''Amoleto has vasculitis which is an auto-immune disease. His leg was always big and often with very painful open skin. We use now sox for horses since December 2017 and his leg has improved drastically. He wears them 7x24 and is happy with the sox "
Pastern Leukocytoclastic Vasculitis, is a relatively common but poorly understood skin disease. The problem generally affects mature horses and produces lesions conﬁned to the lower legs that lack pigment. Initially, redness, oozing and crusting open sores develop, followed by swelling of the affected legs. Long term cases may develop a rough or warty appearance. The cause of pastern leukocytoclastic vasculitis is not yet known, but an immune component is possible. The fact that the lesions are limited to non-pigmented areas of the skin suggests a role for UV radiation. Adverse drug reactions may play a role, and recent studies have implicated a Staphyloccus bacterial infection as a possible cause. A diagnosis is made based on skin biopsy of the affected area, which would show leukocytoclastic vasculitis (inﬂammation of the blood vessels) with vessel wall degeneration and clots involving the small vessels in the surface skin layer. A reduction in sunlight exposure is very important, either by bandaging the legs or stabling inside during daylight hours. The problem usually starts in the rear of the pastern region and is covered with tightly adhered crusts. Over time, the lesions extend up the leg and can affect the skin as high as the knees or hocks. This is a frustrating condition that requires accurate diagnosis and aggressive, determined treatment. It will take vigilance, patience and daily care. So what are silver whinnys? how to put on and take off the sox? Measure a front hoof and measure a rear hoof. Usually the front hooves are larger than the rear hooves. If there is a dramatic difference between the front and rear hoof measurements. You may need to mix a set, one size for the front hooves and one size for the rear hooves. Two Measurements per hoof needed. 1. Length = from the tip of the toe to the end of the heel bulbs. 2. Width = the widest width of the hoof. Warmblood/Thoroughbred cannot fit over a hoof that measures more than 7”(17,78cm) x 7”(17,78cm) width/length with a shoe. If the horse does not wear shoes, the socks may fit 7.25”(18,41cm) x 7.25” (18,41cm) hooves without shoes. Mammoth Donkeys: Go by hoof measurement above. Mules: Go by hoof measurement above. If the hoof measures too close to the top end of one size but the next size up is too large, order the larger size up. #01 What size should I order? #02 How do I measure the hoof? #03 What length should I order, regular or short? #04 How many socks do I need? #05 Are the socks the same front and back? #06 Which is the top or bottom of the sock? #07 How do I put on the socks? #08 How do I take the socks off? #09 How do I know they are the correct fit when I get them on my horse? #10 Do horses accept the socks? #11 Do you have socks for a horse that can't pick up its feet? #12 Do you make draft size Silver Whinnys®? #13 Do the socks come up over the hock and knees? #14 Do you have hock and knee extensions in the Silver Whinnys®? #15 How do I wash the socks? #16 How long will the silver last in the socks? #17 How long can Silver Whinnys® be left on? #18 How often do I adjust the socks? #19 What if I can't adjust the socks twice a day? #20 Will the socks stay up? #21 Can I ride my horse with the socks on? #22 Are the socks too hot on the legs in warm temperatures? #23 Do I need to waterproof the Silver Whinnys®? #24 Are Silver Whinnys® waterproof? #25 When do I need to keep the socks dry? #26 What happens if they get wet from rain or from a horse going into a pond? #27 How long will the socks last? #28 Can Silver Whinnys® be used during the winter? #29 What is the difference between the Silver Whinnys® and the Whinny Warmers®? #30 What if my horse has never had wraps or bandages on its legs? Will the socks work? QUESTION #02 How do I measure the hoof? Using a flat ruler from your desk or a tape measure, pick up the largest hoof. Looking at the flat, bottom of the hoof, measure from the front tip of the toe to the end of the heel bulbs. It is a straight line from the front to the rear of the hoof. Include the bulbs because they must also go through the socks. Then turn your ruler width-wise and measure the widest width of the hoof. Those are the two measurements you need to determine the size of the socks to order. QUESTION #03 What length sock should I order, regular or short? Regular length is most often the best choice. This length will provide optimum protection up and down the leg. If the horse has EPD (Equine Pastern Dermatitis) on the legs, and the horse is allowed pasture turnout, the regular length socks are recommended. 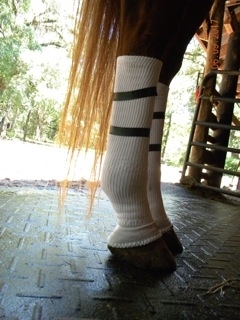 Short version socks were created for a veterinarian who specializes in EPD (Equine Pastern Dermatitis) issues on horses in the show barns where grooms and trainers are always present and the socks can be monitored to see that they are in place over the sores. Unmonitored horses can walk out of the short version socks. Horses on turnout can walk out of the short version socks. Where horses are closely supervised, the short version socks are easy to put on and take off when the socks need to be changed often. To for help in keeping the socks in place when you are using either length. QUESTION #04 How many socks do I need? We recommend a set of four (4) socks as a good start. If you are using the socks for fly protection, they need to be washed every 2-3 days to keep the elastics and yarns optimized; one set will have all 4 legs protected. If you are using the Silver Whinnys® as a bandage/barrier for dermatitis or injuries, the socks must be changed daily and replaced with clean, dry socks. If only two legs are involved, one set of 4 socks will provide 2 socks on and 2 socks clean and ready, but this will require you to machine wash and dry a pair of socks daily. If 4 legs are involved, you will need two sets of 4 socks so that one set is on and one set is clean and ready. Sox For Horses, Inc. offers pairs for those wanting to replace older socks with new ones. A pair of socks could be a choice if you are not sure if your horse will accept the socks. Used pairs are not refundable. If you need the socks as a bandage/barrier for dermatitis or injuries, one pair is not enough. You would have to leave the legs unprotected while the socks are being laundered. When the socks are used as a barrier/bandage, they must be replaced every 24 hours. If the weather conditions are constantly wet and muddy, the socks must be changed twice a day to keep the silver action optimized in the socks. If you utilize our tech support, we can help you get your horse use to the socks. Get the number of socks you need so that you can live with the washing/drying needs. QUESTION #05 Are the socks the same front and back? There is no difference. Silver Whinnys® can go on either the front or rear legs. QUESTION #06 Which is the top or bottom of the sock? The bottom of the sock that covers the top of the hoof and the back of the pastern is called the "Foot." It has a colored finishing thread. Warmblood/Thoroughbred has red thread, Quarter/Standard has green thread, Sport Pony has yellow, and Standard Donkey has blue. The "foot" of the sock has a very obvious flare to it. QUESTION #07 How do I put on the socks? QUESTION #08 How do I take the socks off? QUESTION #09 How do I know they are the correct fit when I get them on my horse? The compression values in Silver Whinnys are based on “normal, healthy” sizes of the cannon, fetlock, and pastern collected by survey on equine leg sizes. The legs of horses suffering from edema due to injury, chronic cellulitis, lymphedema, or lymphangitis are not normal, healthy legs! Silver Whinnys should not be utilized as a compression tool unless advised by a veterinarian or a practitioner skilled in lymphatic drainage. Silver Whinnys can be used to protect legs from external hazards that can trigger episodes of edema, but proper fit for animals with edema conditions is very important. Proper fit is everything. Proper fit allows a woman’s hand to slide down between the sock and the cannon bone of the leg and still not feel tight. Snug, yes, but tight implies that your hand is experiencing a compression that is uncomfortable and you perceive it to be too much for your horse. You are the “boots on the ground,” and if the socks feel too tight, the fit is not right. QUESTION #10 Do horses accept the socks? Start with just one pair of socks the first day. Begin early in the day when you are there to keep an eye on your horse. Don't leave the horse alone until you know s/he is comfortable with the socks. If the first day goes well then leave that first pair on overnight. Do not add any more socks until the next day when you can once again, spend time with your horse to see how well it accepts having socks on all legs. This is a kindness. You are allowing your horse to accept the socks, not demanding that it does. Also read: What if my horse has never had wraps or bandages on its legs? Will the socks work? QUESTION #11 Do you have socks for a horse that can't pick up its feet? QUESTION #12 Do you make draft size Silver Whinnys®? Very large Warmbloods, draft breeds including draft cross, Friesians, Gypsy Vanners, and some of the large Welsh Ponies may fit into this category. Socks for these horses are custom made to fit. We can either have them made for you or if you are proficient at sewing, you can save paying a seamstress and make them yourself. Go to this link-- Custom Silver Whinnys® Draft Sox (.pdf)--to see instructions on how to make your own custom draft socks. If you need help to determine how many socks to order or would like Sox for Horses to create the socks for you, call us at US 1 850-907-5724 with your hoof measurements. Costs are subject to how many socks are used to make a set or pair. QUESTION #13 Do the socks come up over the hock and knees? No. They do not. For Custom Bandaging needs, call us or email. We want to see your challenge! If we can see the problem, most likely, we can come up with the best bandaging solution and we have a number of options. QUESTION #14 Do you have hock and knee extensions in the Silver Whinnys? Not officially for Silver Whinnys. The only Hock/Knee extensions we offer are the Whinny Warmers®, the winter socks, but they are not appropriate for summer wear or wound care. If you have a horse in serious trouble as a result of open sores on the hocks, best to call us. We have good bandaging options for these joints and are happy to help you sort out the best solution. Call or email. We can help. QUESTION #15 How do I wash the socks? Machine wash and dry the socks using warm/hot water and medium/high heat to dry. Machine washing is the best way to clean the socks before putting them back on the legs and will restore the fit of the socks. Avoid bleach as it breaks down the elastics. Avoid detergents with fragrances, as these are cheap chemicals that should not be placed against angry, open, tissue. A "free & clear" detergent is always the best choice. Avoid fabric softeners or fabric softener dryer sheets as these introduce another chemical substance that coats the silver yarn and prevents it from acting optimally in the socks. You can use something like Oxiclean® for stains, but stains do not inhibit the silver from functioning in the socks. The socks are going to get dirty. Machine washing and drying is way to clean them. Washing and drying the socks often is the best care for Silver Whinnys® and it helps to restore the function that allows the socks to stay in place on the legs. QUESTION #16 How long will the silver last in the socks? The silver is embedded in the yarn of the socks. It will not degrade, weaken or wash out for the life of the socks. Each time you wash them, the silver becomes as powerful as it was the day you bought them. QUESTION #17 How long can Silver Whinnys® be left on? Ideally the socks should be worn all the time when protection is needed unless your horse is being exercised or ridden. It is recommended that the socks be changed every 2-3 days with clean, dry socks IF your horse does NOT have any dermatitis, sores, wounds, or fungal infections. The silver in clean dry socks is at peak ability to inhibit bacteria and fungi for only 24 hours. After that, the action of the silver diminishes as the barn dirt eventually overwhelms the silver, and the socks must be washed to regain their effectiveness. If your horse has dermatitis, sores, wounds, fungus infections, or an injury, the socks must be changed at least every 24 hours and replaced with clean socks so that the cleanest bandage/barrier is always in place over those conditions. Healing can happen when sores/wounds/injuries are protected against insects and the dirt of the environment. QUESTION #18 How often do I adjust the socks? Like any horse wear, the socks should be observed/adjusted 2X a day. Horses are rough on clothing. Buckles can break. Velcro® can come apart. Garments can tear. Fly masks can become twisted on the face. Silver Whinnys® can't hurt your horse, by falling down on the pastern, but you don't want to leave them that way. Observe/adjust as needed 2X a day. Make sure when you adjust them that you line up the knit straight on the leg. Don't twist the socks. When taking them off, pull them up first, straighten them so that the knit is straight and then remove them. Observing/adjusting the socks 2X a day will help the socks last longer. QUESTION #19 What if I can't adjust the socks twice a day? If you don't see your horse twice a day, make arrangements with others to check the socks. If you can't do this, they will not work without help but always best is that the socks are observed twice daily. QUESTION #20 Will the socks stay up? Fit is everything. The socks must go over the hoof first and foremost. They will fit the leg once they are over the hoof. If you are in doubt about size, contact us before you purchase. Measure the widest width and the longest length of the hoof. If your horse is suffering from conditions which cause swelling/edema please take a minute to read "About Compression And Silver Whinnys" so that you know how our socks can help, when to use them and when not to use them. Silver Whinnys® stay up for many hours on most of our customer's horses but as with any horse wear, check them twice a day- in the morning and evening to make any needed adjustments. If you don't see your horse twice a day, make arrangements with others to check the socks. If you can't do this, they will not work without help but always best is that the socks are observed twice daily. Don't put all of the socks on your horse at one time! Put two socks on your horse at first. We believe this is best done in the early day when you can see how your horse accepts them through the day. If all goes well, then you can leave those first two socks on overnight. DO NOT put the other socks on your horse until the next day when you have time again to observe your horse's reaction to wearing all 4 socks. Silver Whinnys feel different from anything else your horse has ever worn on its legs. Allow your horse to gradually and gently get use to them. If you use only two socks and decide they won't work for your horse, you can return the unused socks for a 100% refund. Stage 2 healing present challenges to any bandage. Pain, itching, edema, inflammation, infection and even self-mutilation can play a role in Stage 2 healing. Silver Whinnys are not exempt from these challenges. We have helped horses heal all over the world and have found great solutions for helping to keep the socks in place on the legs while conditions heal. We welcome a call or email if need more support to help your horse through specific challenges to the socks. Silver Whinnys are great for insect, UV and wound protection and we seldom fail at helping people help their horses get use to and get through difficult healing or protection issues. See our "Return Policy" but don't give up unless we fail to help you with the socks! We are good at working with nearly 98% of the horses out there that are safe to handle. QUESTION #21 Can I ride my horse with the socks on? Sox For Horses, Inc. does not endorse riding a horse wearing the socks unless a full performance boot is used to keep the socks in place. Keep an eye on the position of the socks on the legs even if a boot is worn over the socks. We have heard that the socks are used to prevent boot abrasions. We have also heard of trainers taking the excess length of sock above the performance leg boot, folding it down over the top of the boot, and using duct or electrical tape to hold it in place over the boot. We expect this technique is very effective in keeping the socks in place beneath the performance boots. Caution: Bell boots are not leg boots and will not keep the socks in place! Nothing replaces due diligence in making sure the socks are in place on the legs when riding or exercising, even with boots. QUESTION #22 Are the socks too hot on the legs in warm temperatures? Silver Whinnys® are made with a moisture management yarn that wicks moisture from the skin surface. This yarn is already instinctively cool, but the wicking action of the socks also cools the legs. The socks can be worn in the heat of the summer temperatures and the colder temperatures of winter. This remarkable yarn is instinctively warm in the winter. The socks are white to reflect sunlight adding additional support to the cooling science behind the yarn. QUESTION #23 Do I need to waterproof the Silver Whinnys®? NO! Waterproofing will put a coating on the silver yarn and prevent it from doing its job. Do not waterproof them. Change the socks 2x a day if protecting sores and wounds, if the weather is constantly wet and muddy. QUESTION #24 Are Silver Whinnys® waterproof? No. Silver loves water. The socks can become wet, even muddy and the silver will be even more active. As long as you change wet socks daily when protecting wounds and sores, your horses is good to go in wet Silver Whinnys If it is cold, then you may want to use the Woof Wear Mud fever boots to protect the sox, keeping them warm and dry while your horse is outside. Other than that, wet is good. You can even bathe your horse with the sox on. When the air is dry, the sox dry in no time. QUESTION #25 What happens if the socks get wet from rain or from a horse going into a pond? Water is not an issue in itself in the summer months. If conditions are constantly wet and muddy, that is an issue. The socks will do their best to pull the moisture from the skin surface. Socks must be changed at least 1X daily for healthy legs. Clean, dry, socks are important when conditions are constantly wet and muddy as bacteria and fungi are propagating at enormous rates in the environment. Ask anyone who has a horse suffering from mud fever. Constant wet conditions are the enemy. The silver in the socks can only handle that for 24 hours if being used for just fly protection, but if there is a serious dermatitis condition then changing the socks 2X a day with dry clean socks is highly advised. The socks can get wet and they will dry out and no harm done. But if the environment is constantly wet, you must be aware of the escalated growth of bacteria and fungi and keep the socks changed so that they can continue to protect the legs. QUESTION #26 How long will the socks last? As a protected bandage, socks can last a long time and the constant washing and drying that is needed to keep clean socks on the horse's legs everyday is actually good care of the socks. Their value will be demonstrated everyday by saving you the money of expensive bandaging materials. The silver will not degrade or wash out of the socks and is there under the toughest circumstances, for the life of the socks. It's also possible that the length of the socks will make a difference to your horse. A horse that is hostile to the regular length socks might respond favorably to the Short Version Silver Whinnys® and vice versa. QUESTION #27 Can Silver Whinnys® be used during the winter? Yes. Many equine owners are trying to resolve dermatitis issues and injuries well into winter. Silver Whinnys are a year-round bandage/barrier. Winter presents challenges to any bandaging but Silver Whinnys are adaptable and there are many ways of protecting them from the snow, rain, mud, and freezing temperatures while they protect the wounds and sores on your horse's legs. The key is to keep them warm and dry on the legs. If your horse needs some time outside, try Woof Wear Mud fever turn out boots OVER the socks (remember to order one size larger as they have to fit over the socks), or take the socks off until you bring the horse back in. Then clean the legs and put the warm dry socks back on. The yarns and the functions of the yarns are the difference. Silver Whinnys® are made with a silver embedded yarn. They are leg protection for wounds, sores, and injuries. They provide protection against the insects that carry disease from one infected animal to another. They are cool on the leg in the summer and they are tolerant of being wet, even being on the legs while a horse is being bathed. Whinny Warmers® are a winter sock only. Made with infrared yarn known for its ability to increase circulation, they offer warmth and comfort to horses that suffer from Cushings, Equine Metabolic Syndrome, founder, laminitis, or arthritis during the cold winter temperatures. QUESTION #29 When do I need to keep the socks dry? During the winter when a horse is outside. Winter presents a lot of problems with bandaging as everyone knows. For many horses that are still battling scratches and mud fever, the socks are needed. Keep them as dry and warm as possible during turnout. Snow and ice can build up on the socks because they are collecting warmth and moisture from the legs. This attracts ice and that can make them very uncomfortable on equine legs. As you know, directional standing wraps cannot be used in the pasture. They can cause damage to tendons. To address the winter healing horse and stay with our believe that horses need to move, try Woof Wears mud fever turnout boot, they are meant to protect sox and bandages from winter weather while the horse is outside. QUESTION #30 What if my horse has never had wraps or bandages on its legs? Will the socks work? We don't know. However, we know that there are trainers using them to teach young horses about leg wear. They find them a perfect vehicle for teaching. Be sure to get with us by phone or email so you know how to protect and support the socks while you teach your horse to like leg wear. We've had horses that are known for tearing off bandages and leg wraps accept Silver Whinnys®, but it was a trial and error thing. When the horse is very difficult, try the Short Version socks first. Buy just one pair. We find that these horses might protest the regular length socks and accept the Short Version socks. It's interesting. See what your horse will accept. If the socks are the first leg wear your horse has experienced, put them on early in the day, when you can spend time observing your horse. This is training 101! It's important for horses to learn to accept leg wear. It's important that you give your horse that training experience "hands on" with your full attention to getting a good result. Don't put the socks on and leave. That's not training! Go to: Do horses accept the socks? Do contact us at kim@ofw.one if you have any questions about the size of the socks to order, or if you want to know if they will work for you under your given circumstances. Or call Sox For Horses in the US 850-907-5724. Do read the instructions that come with the socks for putting them on and taking them off. If you do, you will have an easy time of using them. They aren't hard to use. If you are putting them on a horse that is sore or in pain, practice putting on and taking off the socks with a horse that isn't in pain or choose a leg that isn't the one in trouble until you are smooth and practiced. Do Adjust or at least inspect Silver Whinnys® twice a day for correct position and fit. Do put a plastic bag over the hoof before pulling on the socks. We include a Hefty® plastic bag with each pair/set of socks for this reason. Be sure to go buy more! Using the bag will make putting them on a breeze! If your horse doesn't like plastic bags on its hoof then cover all the rough places with duct tape and then pull the socks on. Either way, your job will be simple if all the rough parts of the hoof are covered before pulling on the socks! Do keep an extra set or two handy so that one set is on and one set is ready. This is very important. Silver Whinnys® when used as a bandage must be changed with clean socks every 24 hours in order to keep a strong antimicrobial barrier against the leg. Do wash Silver Whinnys® all you want to. Put them in the washer and dryer. The Silver Whinnys® also will not degrade or wash out. Do wash them in the washing machine and dryer. They will clean better and the elastic will recondition better. Use free and clear detergents. Don't use bleach or fabric softeners. Do continue to use any topical medications your vet advises or prescribes. Do tell us what you think about Silver Whinnys®. Thanks! Do tell your freinds our socks! Don't use Silver Whinnys® if your horse won't allow you to safely be around its legs! 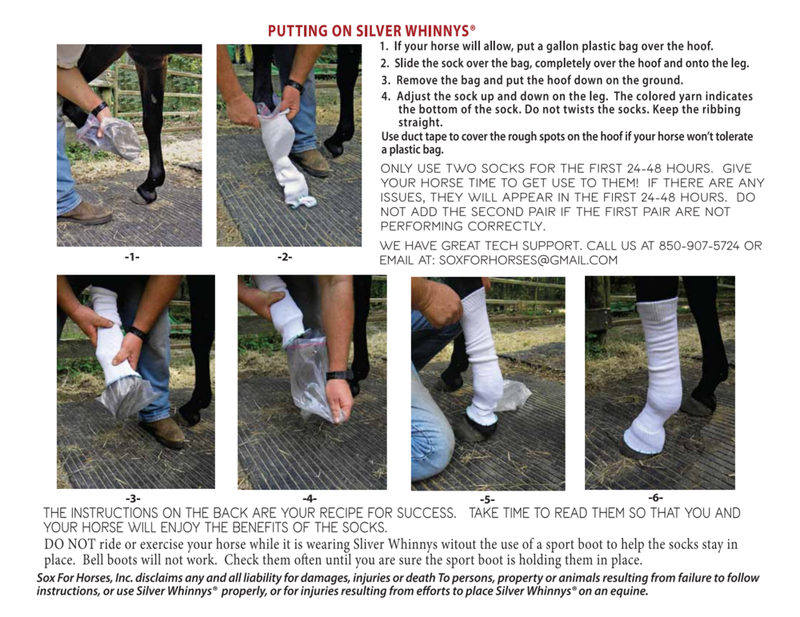 Using Silver Whinnys® requires that you can handle a horse's legs and feet. If you have a horse that won't let you safely around its legs, do not attempt to put Silver Whinnys® on that horse! Don't leave your horse for over 12 hours without inspecting any horse wear that you might be using! If this you can't see your horse twice a day, contact us so that we can help you figure out an alternative. Don't use Bleach or chlorine. Avoid perfumed detergents or softener sheets as these can irritate equine skin. Don't put all of the socks on your horse at one time! See our FAQ page. Gently introduce your horse to all things new. Don't ride or exercise any horse when it's wearing Silver Whinnys®. We've never had a horse injured because a sock came off, but you don't want to be on board if it happens because the horse could trip or stumble. Don't worry about wet Silver Whinnys® They love the wet. Moisture activates the antimicrobial qualities of the socks so wash the horse while the socks are on! But in the winter, for outside horses keep the Silver Whinnys warm and dry using Woof Wear Mud fever Turnout boots. Don't buy them if you don't see your horse for days and no one can observe that the socks are up and in place. #01 Are the Silver Whinnys® for fly protection? #02 Do the socks offer compression? #03 Can Silver Whinnys® heal scratches, dew poisoning, summer sores, or a wound/injury? #04 Can the Silver Whinnys® help with Mud Fever? #05 Will Silver Whinnys® help my horse with Lymphangitis? #06 Can the socks help with dew poisoning? #07 My horse has bedsores. Can your socks help? #08 Can I continue to use the external medications my vet has recommended? #09 Can Silver Whinnys® provide UV protection for my horse's white legs? #10 My horse has a very bad injury on the legs. Will the socks help? #11 Can Silver Whinnys® protect my horse from cuts and bruises in the paddock? #12 My horses come back with scratches from a competition. Will your socks prevent this? #13 Do you have socks or can you make socks for a dog with skin problems? #14 I have a draft horse with sores. Do I need to trim off the feathers? #15 Do I need to continue medicating the sores? #16 Why do you change the sox every 24 hours when sores are present? #17 Can Whinny Warmers® the winter socks be used as bandages for sores and wounds? #18 What is your return policy? QUESTION #01 Are the Silver Whinnys good for fly protection? Yes. Success with any fly protection comes from starting early in the spring before your horse begins to stomp obsessively as a habit. Silver Whinnys are double-layered socks that insects cannot penetrate to cause more damage to the legs. See our article: "Flies and Silver Whinnys" and "Stop The Stomping"
QUESTION #02 Do the socks offer compression? Silver Whinnys utilize a safe level of compression to stay in place on the legs. They offer a resting level of compression but not tight compression. If they are very tight on the leg, they may be too small for your horse. You should be able to slide your hand, if not a large hand, snuggly between the sock and leg. The stretch of a sock allows it to go over the hoof. The light level of compression causes it to come back and conform to the leg. See "ABOUT COMPRESSION AND SILVER WHINNY:" Our compression lab results are included in this article. QUESTION #03 Can Silver Whinnys heal scratches, dew poisoning, summer sores, or a wound/injury? Sox For Horse, Inc. makes no claims that the socks will heal, cure, or prevent leg conditions. The silver does not have a chemical reaction with the skin. The reason the results are profound is because the sox are a knitted, high tech bandage providing a barrier against the insects and dirt of the equine environment. QUESTION #04 Can the Silver Whinnys® help with Mud Fever? Yes. Mud fever appears during constant muddy and wet circumstances regardless of summer or winter and is difficult to completely heal. Silver Whinnys offer the protection to keep the skin clean and dry. It takes more effort to heal anything in these conditions, and though the socks can keep wounds and sores clean, they must be changed at least once a day for the silver to optimally inhibit the exponentially propagating bacteria and fungi in the socks in wet, muddy conditions. Keeping the socks as dry and clean as possible can help but when a horse is on turnout 24/7, changing the socks twice a day is the way to keep the silver hardest at work. To keep the sores clean, the socks must cover the sores. Don't duct tape over any of the skin areas. Air should be allowed to reach the tissue. During the Fall, Winter or Spring, Woof wear turnout boots can be a huge asset in keeping the sox clean and dry making your task much simpler. QUESTION #05 Will Silver Whinnys® help my horse with Lymphangitis? First, we want you to read an article we have published on this subject which was co-written by Dr Steve Soule. This article will really help you understand why we feel about how our sox can integrate with your vet's treatment plan. The second article you should read is our article ABOUT COMPRESSION AND SILVER WHINNYS® This article provides our Lab results on our socks compression values and will again, help your vet determine how and when they will fit into the treatment plan. We make custom socks as well to fit special situations where the legs must have the bandage barrier and also very little compression. Contact us regarding custom made socks. We know that it is critical to heal the secondary infections on the skin surface when trying to help a horse with lymphangitis, lesions, and other forms of infection-driven edema and tissue stresses. Silver Whinnys® maintain a clean environment around the legs useful for reducing dirt and debris near any pre-existing wounds/sores, and they reduce the bio-burden on the contact surface of the socks. They provide the protection needed to help owners make forward progress in eliminating the secondary infections. QUESTION #06 Can the socks help with dew poisoning? Dew poisoning is partially caused by excessive moisture for prolonged periods on the grass. The wicking fiber of the socks will pull the moisture from the skin tissue, keeping it dry. When dermatitis issues are very bad and low on the pastern, near the bulbs or the top of the hoof, and your horse is out in pasture, you might consider adding a pastern wrap if the socks are being pushed off the skin by the grass. A wrap can securely and safely insure the sock material is constantly over the pastern regardless of the horse's activities in the field. Though you will lose the air reaching the tissue, healing is not slowed down as long as the hygienic environment is against the skin tissue. We know this from working with wounds in bitter cold sub-zero temperatures where the wounds had to be wrapped in order to prevent them from healing. See our study page, case Jeta. Oxygen is good, but protection is a necessity and that can mean making sure the sox stay over the pastern tissue. When the horse comes back from the pasture, you can inspect the socks to see if they are wet and change them if so. Most of the time, the socks will dry on the horse after the dew is gone. We've heard this works great and we've heard that existing cases of dew poisoning go away when the socks are changed daily with clean, dry socks. Dew poisoning must have a wet, warm, environment to persist. The socks are cool and they keep the skin tissue dry while allowing air to reach the skin. QUESTION #07 My horse has bedsores. Can your socks help? It is important to resolve bedsores quickly as they can turn into chronic pressure ulcers that become repeatedly infected and more difficult to heal. The longer a sore remains unresolved, the weaker any new skin or tissue developed will be. Weakened tissue is the revolving door of nearly healed to back-to-open oozing. Bedsore boots by themselves can be problematic if your horse has skin reactions to neoprene, the most commonly used material for boot construction. Every situation is different for horses with bedsores. You must heal the sores first. Silver Whinnys® can work in tandem with various protection hock and fetlock gear to make them more effective and safe against your horse's skin while preventing further injury. The sox will help to keep the heat from building up beneath a neoprene boot. The socks will continue to wick the moisture from the skin and keep the environment around that damaged tissue clean. Fitting hocks can be an issue if you have a large horse. Sox For Horses now makes the "Large Bandage Sock" for bandaging hocks and when worn with the Hock Shield, we've helped many horses resolve these issues. Email me at kim@ofw.one to order the "Large Bandage Sox" They are a specialty bandage and not listed on our Buy Now Page. We want to review your horse's situation to make sure these bandages will work for your horse. The beauty of the "Large Bandage Sox" is that they are so large they will not constrict circulation nor movement anywhere on a large joint even when your horse lies down. They are made of the same great silver yarn as the Silver Whinnys. We are happy to discuss individual situations and help owners find the appropriate bandaging application for their horse. Bed sores on knees can be the most challenging and we invite you to call or email us to discuss options. We have options for the knees! After the sores are healed continue to use the Hock Shields®, Fetlock Shields® and fetlock boots without the sox. They will help protect these sores from reopening. Many times you can't change the way your horse rises or lies down. Past injuries or illness sometimes make this impossible to correct. However if your horse has recovered and the condition isn't chronic, often getting your horse back over his feet with correct trimming and sessions of chiropractic can help your horse begin to correct the way it rises and lies down. Talk to your vet about bringing your horse back to full balance again so that bed sores become a thing of the past. QUESTION #08 Can I continue to use the external medications my vet has recommended? Yes. Topical medications prescribed by your vet should always be continued! Our socks work in harmony with prescribed medications. Our job is to partner with your veterinarian by being a part of his/her healing strategy. If they have a preparation or medication they feel necessary, it should be continue to be used. If you are using sauerkraut, old motor oil, bacon grease, other home-made preparations, and even things like Tea Tree Oil, stop. Better here to keep it very simple and let the socks do their job. Tea Tree Oil, though good for some things is a powerful astringent and can actually cause a bad skin reaction. We have often wondered how a horse feels when the vinegar of sauerkraut is applied to raw open wounds. Often horses are so over treated that they become angry about being handled. Get in touch. We have solutions to help your horse through this pain and over handling in a way that will help protect you and the horse. Too many people confuse healthy granulating tissue with proud flesh. Be careful self-medicating. A preparation designed to eat away proud flesh can actually be eating away healthy granulating tissue. QUESTION #09 Can Silver Whinnys® provide UV protection for my horse's white legs? QUESTION #10 My horse has a very bad injury on the legs. Will the socks help? Most likely. They are a powerful bandage/barrier. SFHs offers a number specialty custom bandaging options that are not listed on our cart. The right choice will depend on the present condition of the injury. We also will work in concert with your veterinarian. Contact us via email. Send photos of the injury. Be sure to include your phone number so we can talk to you about bandaging options and discuss what has been done so far as well as assess your ability to effectively use the bandaging choice. QUESTION #11 Can Silver Whinnys protect my horse from cuts and bruises in the paddock? They are great as a bandage to protect injuries while they heal, however they are not thick enough to prevent every injury. From my personal experience, my own horse became tangled in some strands of barbed wire last summer. He was wearing his socks. Though the wire got tangled in both rear leg socks to the extent that the socks had to be cut off, his legs were without injury. I think that had the wire been able to really bite into his legs, I would have seen far more injury but it bit just enough to cause him to stand and wait for help. I believe the socks prevented serious injury in this case. The best answer is to make sure your pasture is as hazard free as possible. How this wire ended up in my pasture is a mystery to me. QUESTION #12 My horses come back with scratches from the events. Will your socks prevent this? QUESTION #13 Do you have socks or can you make socks for a dog with skin problems? Please contact us. Email us. This would also be custom work, but we have done it. Larger dogs can wear our miniature size socks on their legs for "lick" granulomas. Smaller animals would take some custom work, but we can do it. QUESTION #14 I have a draft horse with sores on the legs. Do I need to trim off the feathers? The socks should lie against the skin for the best protection. This is a difficult choice to make but the feathers/hair covering the scratches, summer sores, or other dermatitis issues harbor the bacteria and fungi that are causing these conditions to persist. Leaving the feathers on is like putting dirt between a cut and a bandage on your finger. QUESTION #15 Do I need to continue medicating the sores? If your vet recommends a topical application, do as your vet advises. A clean, breathing, dry environment around the sores can be a powerful aid in helping you heal these conditions on your horse's legs. QUESTION #16 Why do you change the sox every 24 hours when sores are present? Bacteria, fungi, and mold propagate at astounding rates, particularly when the environment is wet and warm. The silver in the socks can only inhibit the microbe growth in the socks for a certain amount of time before the bacteria, fungi, and mold have propagated beyond the capability of the silver to control it. In a barn environment, 24 hours is the most you can ask. If the weather is constantly wet and muddy, changing the socks twice a day is advised until the weather clears and dry conditions are present. Taking these measures protects the healing and in the case of constant, wet, muddy, weather, is essential in promoting healing. No. Whinny Warmers® are used for warmth and circulation. Though they have silver yarn on the inside of the socks it is not enough silver to control the bacteria and fungi in the socks nearly as well as Silver Whinnys, which are made of our silver embedded yarn. Whinny Warmers® are for circulation-impaired horses or those suffering from the pain of arthritis during cold winter temperatures. QUESTION #18 What is your return policy? New-unused socks will be refunded at 100% of your purchase price. You must return the socks for replacement, or refund within 30 days of your purchase. Returns must include a copy of the packing slip or purchase receipt. The cost of shipping and handling is not eligible for refund nor is return shipping costs. SFHs recommend that you return socks inexpensively using an equivalent to Royal Mail with "Delivery Confirmation". You must get the socks to SFHs for a "return" credit. Outdoor Functional Wear will refund 30% of your purchase price on used socks. New-unused socks will be refunded at 100% of your purchase price. You must return the socks for replacement, or refund within 30 days of your purchase. Returns must include a copy of the packing slip or purchase receipt. The cost of shipping and handling is not eligible for refund nor is return shipping. Exchanges can be made with an additional payment for shipping and handling. Items that have been previously replaced because of a sizing exchange are not refundable. Fit is everything. The socks need to go over the hoof first and foremost. They will fit the leg once they are over the hoof, so if you’re in doubt about size, contact us before you purchase. Measure the widest and the longest parts of the largest hoof and then call us. Once you receive the socks, view the video on the home page showing how to put them on and take them off. This is a very helpful video and will make your first experience with them a breeze. Silver Whinnys™ stay up for many hours on most of our customer’s horses but as with any horse wear, check them twice a day- in the morning and evening to make any needed adjustments. If you don’t see your horse twice a day, make arrangements with others to check the socks. If you can’t do this, then don’t use the socks. For the safety of the horse, horse clothing of all kinds requires an owner to observe that the clothing is correctly placed on the horse at all times. Don't put all of the socks on your horse at one time! We know that good horsemen and women know better, but we are going to say this anyway. Put two socks on your horse at first, usually the front leg socks are best to try first. Watch for a few hours to see how your horse gets along with them. If your horse accepts the first two socks, then leave them on the horse overnight. Give your horse plenty of time under observation to make sure all is well with the first 2 socks. DO NOT put the other socks on your horse until the next day when you have hours of time again to observe your horse's reaction to wearing all 4 socks. Silver Whinnys™ feel different from anything else your horse has ever worn on its legs. Don't think because the horse is use to wearing wraps that it is the same thing. Don’t overwhelm your horse with new things all at once. Let them get use to the idea gradually and gently. Adjust the socks in the evening and in the mornings for great results and to make sure that they are in place on the leg. Typically you should expect the socks to settle a couple of inches from the knee or hock on the cannon within an 8 to 12 hour period of time. On all other horses, mules, and donkeys, the socks are staying in place for hours providing a clean, breathing, cool, and protective environment around the leg in which sores and wounds can heal. DO NOT USE THESE SOCKS ON ANY HORSE THAT WILL NOT ALLOW YOU TO SAFELY HANDLE ITS LEGS. The socks come with instructions for use and application in the packaging. Little information is accessible about applied compression levels relative to the structure of the equine leg. The information available bases applied equine compression quantities on human leg studies. Compression applications use mmHg, which stands for millimeter of mercury, a unit of measuring pressure. When measuring compression stockings for humans, mmHg refers to how tightly the elastic medical stockings support the veins in the leg. The higher the mmHg number, the greater pressure the graduated stocking will apply to the patient’s leg. Even manufacturers of the Jobst Pump-type equine compression equipment, used to stimulate fluid movement up and down equine legs, apparently use human studies as the basis for determining the amount of mmHg to apply to a leg given certain medical conditions. If there were studies in applicable mmHg for equines, we would welcome this information. In its absence, we acknowledge that applying compression to an equine leg is not an exact science. Lacking definitive studies on equines, we avoid adding more compression to our socks than the existing light, resting level of compression necessary to support the socks up on the legs. Are they subject to falling down? Yes, they could, but we are not willing to increase compression and end the ability our socks offer to be a safe bandage/barrier on equine legs at all times in pasture, paddock or stalls. We want any equine owner, skilled or unskilled to be able to use our socks without fear of putting them on wrong and causing undue compression. That is the sock we at Sox For Horses offer. We have provided advice for helping the socks stay up and on equine legs. Silver Whinnys can be worn safely 24 hours a day, 7 days a week, in pasture, paddock, or stall. They do not need to be removed from the legs before a horse is turned out. They do not need to be removed after a few hours to relieve pressure. That being said, the compression values in Silver Whinnys are based on “normal, healthy” sizes of the cannon, fetlock, and pastern collected by a survey on equine leg sizes. The legs of horses suffering from edema due to injury, chronic cellulitis, lymphedema, or lymphangitis are not normal, healthy legs! Silver Whinnys should not be utilized as a ‘compression’ tool unless advised by a veterinarian or a practitioner skilled in lymphatic drainage. Silver Whinnys can be used to protect legs from external hazards that can trigger episodes of edema, but proper fit for animals with edema conditions is very important. Proper fit is everything. Proper fit allows a hand to slide down between the sock and the cannon bone of the leg and still not feel tight. Snug, yes, but tight implies that your hand is experiencing a compression that is uncomfortable and you perceive it to be too much for your horse. You are the “boots on the ground,” and if the socks feel too tight, the fit might not be right. Contact us via our facebook page, email address if you are in doubt. We are always glad to help. *If the socks are already tight and the leg swells, the socks will apply too much pressure on the tissue. Horses with chronic cellulitis, lymphedema, or lymphangitis are very sensitive to pressure. Discuss compression with your veterinarian before you order the socks for this purpose. If your horse is prone to unpredictable swelling, then proper fit is essential so that the socks can serve their purpose of protecting the legs as an antimicrobial barrier without becoming tight under any circumstances. For draft, draft cross, and large Warmbloods, custom-made socks are needed and these are made to be light against the skin so there is little chance that a sudden onset of edema will cause undue pressure. Many have found that the light level of compression offered by our socks is helpful in reducing stocking up after performance or when the horse is at stall rest. The light compression on a healthy horse can be restful. Even horses with proud flesh benefit by this light compression as it can help to reduce or inhibit the development of proud flesh; but too much sustained compression on a horse suffering from acute conditions of edema causes pain and complications. Sox For Horses, Inc. does not believe in inhibiting circulation unless the application is recommended and overseen by knowledgeable veterinarians or practitioners skilled in the art of lymphatic drainage. The use of compression should be determined by a practitioner who can physically assess the condition of the tissues and their ability to withstand pressures on horses suffering chronic conditions of cellulitis, lymphangitis, lymphedema, or excessive edema due to injury. Silver Whinnys can offer a valuable antimicrobial barrier to protect legs from external hazards of the outside environment once your vet has the edema and inflammation handled. 4. A three-legged lameness, when the horse can’t put the leg down on the ground and is avoiding your touch. Your response in minutes, NOT hours can make a difference between permanent damage and a positive recovery outcome for your horse. Sox For Horses offer lab tested compression results for you and your veterinarian to study and consider. We encourage you to research human studies regarding mmHg values in doctor-prescribed compression stockings so that you have a baseline understanding of why Sox For Horses! created a light level of compression that is safe on horses in the pasture or stalls and that will not cut circulation even if the horse pushes them completely down around the pastern. Many manufacturers make compression stockings for people but that does not mean that they correctly apply compression per tested US study-based standards and guidelines. If you personally utilize compression socks for yourself, avoid socks made outside the United States and talk to your doctor about recommended, dependable brands that meet US study-based standards of applied compression. The results in our compression testing are relative to the sizes of socks offered. Four socks in each size were tested to achieve an average compression (mmHg). Testing is conducted based on circumference measured in centimeters: 1 cm is equivalent to 0.39370 inches. Translate these measurements to inches by multiplying the circumference by 0.393. That will give you the conversion in inches. Then you can measure your own horse in inches to determine how our socks will fit your horse. My Miniatures have white legs so they are a godsend. The Silver Whinnys don't make me feel guilty when I am clipping out their little legs, because I know that they will be wearing their Sox. They wash up well and dry really quickly. They are also designed to be kept on a few days at a time. They are a snug fit on my boy and don't roll down. TOP TIP: put a sandwich bag on the hoof to slip the sox over to slide on easier, then remove the bag. I am lucky enough to be admin on two active Sox For Horses Facebook Pages, and I have posted the link from each page where you get to read the reviews from my customers. Both of the pages have customers from around the world and all customers have the freedom to express and share their own personal experiences with Silver Whinnys.